At Chez Boris, Russian doughnuts (known as pyshki) are done as on the streets of St. Petersburg: made to order in less than a minute and served warm. 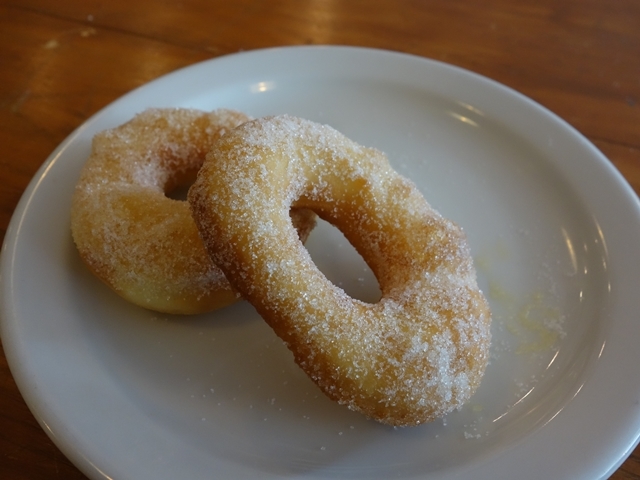 I ordered the traditional Beigne Sucré (pictured above, 80 cents each, 6 for $4.20), a delightful little donut with a generous sprinkling of sugar. This is the carnival-like fried dough of doughnuts, light and puffy and pretty quickly melting in the mouth. Boris puts its own twist in making other flavors, like chocolate or cinnamon and clove. The more adventurous can indulge in a Beignewich—a savory sandwich made with doughnuts—such as salmon with sour cream and red onion, guacamole with cheese and peppers, or a Momofuku-inspired pork belly with hoison sauce. It’s just a seven-minute walk along Fairmount (far enough to easily burn a Boris doughnut?) to reach Sardine, which is a café by day and a restaurant by night. Early morning can be mellow, affording an opportunity to check out the baking in the small open kitchen. 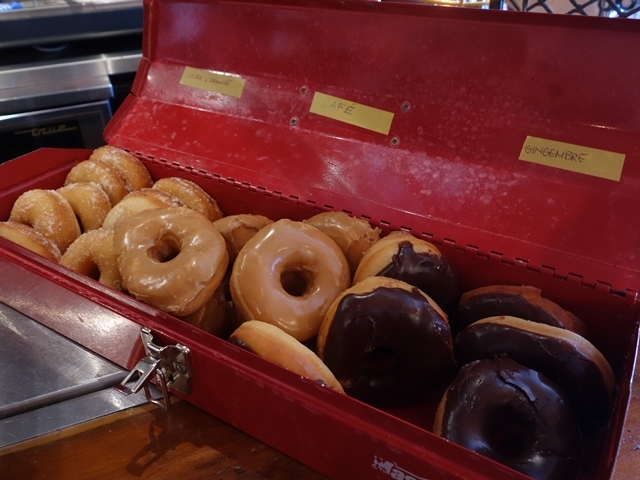 At the bar counter you’ll find the red Mastercraft toolbox with the day’s doughnuts. Flavors change frequently; this day featured gingembre (ginger with chocolate glaze), café (coffee-glazed), and the one I would ultimately choose: the Sucre and Orange Donut ($1.75 each, 2 for $3, 6 for $8). The doughnuts here are a little larger than those at Chez Boris, with a different texture. Sardine’s doughnut is cakier and yet somehow still puffy and melty after the initial sinking in of the teeth. The orange flavor is subtle but pleasant, and the sprinkling of sugar adds just enough sweetness without overpowering the dough. If you’re wondering, both places offer excellent coffee to accompany their doughnuts. Chez Boris boasts Kittel, 49th Parallel and Java Blend, while Sardine was serving up Phil & Sebastian. If, unlike me, you’re not trying to sample as many different doughnut shops and bakeries as possible, you’ll find either place comfortable to relax with coffee and a doughnut or two—or six.